Update 27/5/2017 – comrades now released from custody. Details below. Yesterday an anarchist-comrade along with several others were arrested violently by the police during a solidarity demonstration with Nuriye Gulmen and Semih Ozakca*. Comrades in question are held arbitrarily by the police in custody and in protest of their treatment, yesterday they went on an indefinite hunger strike until they are released. As the anniversary of the Gezi Revolt approaches (the end of May) fascist Erdogan government fears another revolt against its violent dictatorial regime. It is keeping every protester it can arrest as hostage. I will update this as more information arrives. As always, but as it becomes more and more clear everyday, our only weapon against the state and sectarian violence directed everywhere against the working class is international solidarity! 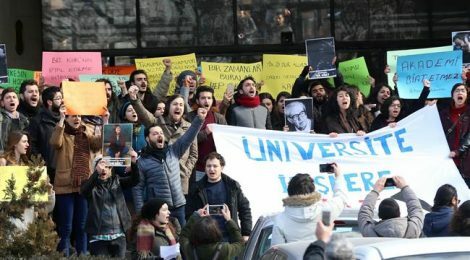 *Nuriye Gulmen, a university professor, and Semih Ozakca, a high school teacher, were sacked by the government for no reason except being leftists and participated in the Gezi demonstrations after the military coup last year. The government officials and prosecutors clearly know that Nuriye&Semih have no ties with the islamist/Gulenist coup plotters who were until yesterday partners of Erdogan in repressing the working class and the Kurds. Unsurprisingly though state officials fear the militant working class people more than they fear coupist Gulenist army generals. Hence, Nuriye and Semih were sacked together with thousands of other teachers, professors and civil servants without any real evidence. Nuriye and Semih are on hunger strike for 76 days. Their only demand is to be reinstated at their jobs. Two days ago they were arrested at their home after a night raid by the police. These people are already under surveillance, their passports have probably been cancelled and they never attempted to hide. The prosecutors asked them if “any radical left wing group promised them any material benefit in exchange of their hunger strikes and if they are trying to overthrow the government by triggering a revolt, similar to the Gezi revolt”. These outrageous questions constituted the basis for their imprisonment. Clearly this naked state terror is only aimed to intimidate the workers not to oppose the government, whose self-confidence is daily eroding and, in fear, using the only weapon it knows best: violence. All those held in custody, including the anarchist comrade earlier mentioned were released a couple of hours ago. However, Nuriye and Semih are still on hunger strike and still in jail. Everyday small solidarity demonstrations and new arrests/house raids are taking place, so the situation is still evolving. On a funny note, today the Ankara governor issued an order that singing in the streets after dark is banned until further notice. The government is trying to stop the expansion of small spontaneous solidarity demonstrations which are taking the form of small occupations and it is sinking to new depths of stupidity everyday in that effort. What is most interesting is dozens of businessmen, who are associated with the Gulenist organizations and the coup plot are getting released, while thousands of teachers and public workers still remain sacked and/or in prison. Clearly the burden of state repression fell on the rank-and-file socialist militants and the working class, while those bureaucrats and bourgeois people who may have any ties with the coup and Gulenist islamist faction remain free. This only shows that government’s real fear is not this or that bourgeois faction but the working class. It fears the anger of the proletariat more than it fears any coup or violent inter-bourgeois conflict.